(Phnom Penh): At the sideline of attending in a widely promotion about a variety of tourist destinations in the small and big national and international events, Cambodia is confident that its tourist destinations are being gotten more and more interesting from foreign tourists on occasion of International Tourism Exhibition (TRAVEX), to be just conducted in Vietnam. Participation in advertising tourism products in the above international event had been done on occasion of His Excellency Thong Khon, Minister of Tourism, led the Ministry of Tourism’s delegations, Ministry of Culture and Fine Arts’ art groups, private companies to take part in the 22nd ASEAN Tourism Ministerial Meeting, which was held at the same time the 38th ASEAN Tourism Forum, from 16 – 18 January 2019, in Halong city, Guangning province, Vietnam. The Ministry of Tourism stated that “International Tourism Exhibition” is a big event in ASEAN established to buy and sell tour packages and tourism services, to exchange, to share experience, and to build up partnership in tourism business altogether forwards to develop tourism in ASEAN region to be better. In the event of 2019 Tourism Exhibition, it was noted there were over 300 Booths with about 1, 500 participants from 52 countries, in which there were 640 sellers, 362 buyers, 145 Medias, 340 meeting attended delegations, and 162 other delegates. 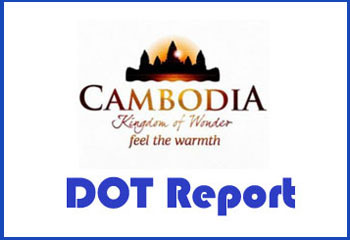 The Ministry of Tourism joined in exhibiting the attractive cultural and natural tourism potentialities with about 12 tourism companies, in which there were 8 hotels, 3 tour agents, 1 tourist boat company, along with 3 artists from Ministry of culture and Fine Arts in order to advertise cultures, and Cambodia’s a great customs. Within 3 days of International Tourism Exhibition Event (TRAVX), the Ministry of Tourism’s delegations discussed works, exchanged experience and information with businessmen and women, investors, Medias, and a number of tourism professionals forwards to enhance tourists, investors to come and invest in Cambodia to be more and more, in which the Ministry of Tourism’s booth welcomed the visiting of over 1000 guests. Mr. Prak Vuthy, Head of Department of Market Studies and Outbound Tours, also made a lecture to international Medias in the Media Briefing over the prosperity of tourism destinations, new tourism products, 2018 tourist statistics and new international tourism events which Cambodia is scheduled to hold in 2019, 2020 and 2021 in which Cambodia also enjoys promotion of Cambodia is hosting country in preparation of 2021 ASEAN Tourism Forum, and International Tourism Exhibition. Cambodia is ready for preparing 2021 ASEAN Tourism Forum to be more successful and better.